Because a few questions can yield great insight, please join me for Fast Five, short interviews with great writers. Life may be full but let's make time for five questions — and the chance to win a great book (see details below). Ruth Harrison was born in Kansas, grew up in Colorado, and has lived in Oregon since 1950. She is a retired professor of medieval literature (teaching at Portland State University, Linfield College, and Oregon Coast Community College) whose poems have appeared in regional, national and international publications. She is author of two textbooks, three chapbooks, and seven poetry collections. Noting her value to the writing community, the Oregon Poetry Association, the state’s oldest and largest poetry organization, recently honored Harrison with a lifetime membership. You primarily write in traditional poetic forms. Is there a particular form you favor, and why? Well, the sonnet — because it is old and mossy, and lovely in its song-like qualities, hallowed by time — and by users like Shakespeare and Keats, leading the way. And the villanelle, which I attempted as soon as I learned its name (in a college class), in part because it sent me looking for a poetry handbook, which led me on to many other forms; and in part because it's a challenge to make the required repetitions not thud on the ear, not seem repetitious and boring. And the triolet because its repeat lines are not so many as the villanelle's, and because it's small and must convey its impact in a short space . . . There are many many short forms Madelyn Eastlund's Poets' Forum had introduced me to, that I have enjoyed no end. The cresset comes to mind for its lovely symmetry and slight rhyme requirements, just enough to make a poet work to get the exactly right word to make meaning and to suit the formal requirement. The struggle is good for us as writers and as craftsmen. And I enjoyed trying a form Lew Turco told me about, the rubliw (named, I think, for Richard Wilbur—? ), that he and his fellow poets have enjoyed playing with at Iowa and later. At what age did you begin to write poetry, and how has your writing changed over the years? I was told I made verses from about age two, but of course was not yet writing, just making. And I made an occasional attempt in school years, fifth and sixth grades, and so on. Then a few efforts in high school and college classes have survived . . . some college efforts made it into a college anthology. My teaching years mostly put an end to the writing, because teaching is so all-consuming, but sometimes when my students were busy with an in-class writing project, I sat writing also, to add to the work-filled intense quiet atmosphere as much as anything. But I didn't give it concentrated attention until I retired from my final teaching position, in 1994. You formed Tuesday, a writing group that has met every week for over 20 years. How has the group influenced your writing life? Tuesday has been a singular blessing. It carries an automatic weekly deadline to have material ready for the next meeting; it encourages revision and craftsmanship; and it takes the loneliness out of the writing life. It provides a first audience for untried work, in an unthreatening setting — a good testing ground. What’s the best writing advice you’ve received (or given)? Will you please share a favorite poem from your new book, West of 101.
the distant sound of surf, here near the glass. only because it’s west— that's where waves are. Across the black . . . nothing alive in sight. December’s endless night, his worklights bright. to light that speaks to her across five miles. to be born, and will have the luck to die. this holiday. And thank you for the light. 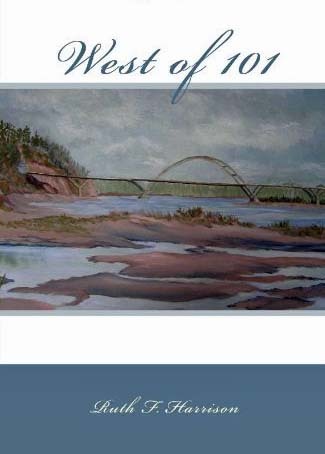 To win West of 101 by Ruth Harrison, simply add your name and contact info in the comments section below. Your name will be entered in a drawing, and the winner announced on Sunday, December 15, 2013. Newer PostDon't you know anything?